"Explore the universe one puzzle at a time!" Game Goal: Solve the crossword puzzle to help a sympathetic alien discover the wonders of planet Earth. How to Play: Select a category and check out the tips to find the words on the board and finally discover the secret word. Graphics: The different categories are personalized with colorful and fun scenarios; the board stands out as it's inspired by a classic crossword puzzle. Controls: Touch the interface keyboard to type the words. Touch the arrows to move forward or backwards. Developer: Fanatee Games is based in Brazil	- High-ranked developer. 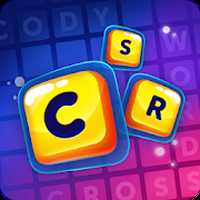 Do you like CodyCross - Crossword? Android games Puzzle Games The best games of April 2017! Great Game!! I've tried to download it on my computer but it tells me I have no device. I love it but would like to play it on my laptop. Can it be downloaded to PC?